In an effort to illustrate the impacts of the latest reverse mortgage program changes, Federal Housing Administration officials presented supporting data at the the annual National Reverse Mortgage Lenders’ Association conference in San Diego last week. For the past 13 months, the reverse mortgage industry has been adjusting to lower principal limit factors and higher initial mortgage insurance premiums. More recently, the industry is adapting to a new appraisal process that requires some Home Equity Conversion Mortgages to obtain a second appraisal. Cheryl Walker, the director of the home valuation insurance division for HUD’s Office of Single Family Housing, presented current data and said that her office’s focus of the past year has been looking at the positive or negative effects of the recent program changes. Numbers confirm that endorsement volume is down in terms of number of loans and total dollar amount in comparison to the same period last year. Looking at HECM volume for the fiscal year through August 31, 2018, endorsement numbers were down from approximately 55,000 loans to 45,000 loans from the same period ending in 2017, and endorsement dollar amount was down to $15.2 billion from $17.7 billion from the same period last year. “That is somewhat to be expected as a result of the changes that were made around the MIP and principal limits,” Walker said. While the changes dragged volume down, the full extent of the effects is not completely clear as 45% of the endorsed loans were originated pre-October 2, and so were not subject to the changes, HUD representatives explained. “We do not have a full year’s worth of transactions in order to fully understand the impact of this particular change,” Walker said. She did however say that HUD was able to determine that the average principal limit was 55% for fiscal 2018, which was a decrease from 59.7% in FY 2017. Of the loans endorsed in FY 2018, 90% were adjustable rate and 10% were fixed rate, which is about the same ratio as FY 2017. Data also addressed changes brought by financial assessment. Of the 45,453 HECMs endorsed through August 31, 2018, 13.65% had a fully funded lifetime expectancy set aside (LESA), 0.03% had a partially-funded LESA, and 1.03% opted for a voluntary LESA. Walker said HUD leadership continues to have confidence in the value of these financial safeguards. “We believe the set asides for property charges are an important tool for mitigating against tax and insurance defaults, so — to the extent that borrowers choose to have a voluntary life expectancy set aside — we believe that’s a benefit to the program,” she said. The panel also addressed the topic of appraisals. Beginning in October 2018, all HECMs are required to go through a collateral risk assessment, with a second appraisal being required for any numbers that appear inflated. Walker said that early numbers show that a third of the required second appraisals have come in higher than the initial value, a third have come in less than, and the other third have come in as the same value as the initial appraisal. 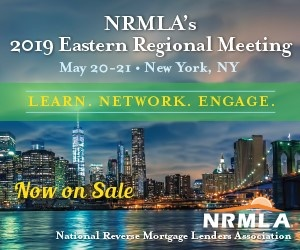 At another panel discussion, NRMLA’s HUD issues committee said that it appears that approximately 19% of all loans require a second appraisal. Gisele Roget, HUD’s deputy assistant secretary for single-family housing, was also on the panel. She reiterated that all of the changes have been for the health and self-sufficiency of the program, but she said that she understands the changes have been difficult. “We’re very much aware of the impact of the changes that were taken in 2017 and we understand the tremendous impact on originators,” she said. In other updates, the panel also confirmed that there continues to be more counseling certifications than loans endorsed, but that the percentage conversion rate was much higher for FY 2018 — 78% — than FY 2017’s 53%.